One of the most expensive parts of a reception is the cost of catering. Luckily, it is one of the best and most memorable parts of a wedding too. 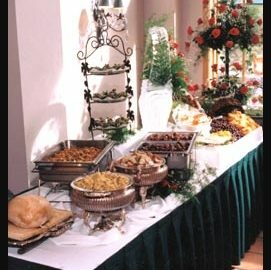 Generally, caterers will charge by person, so the more guests you have the more you should plan on spending. There are so many different types of meals you can have – this list will help you find the best one for your style and budget. Breakfast, Brunch, or Tea– These are usually done for a morning or afternoon reception. Often they are the least expensive choice. These meals are especially good for spring or summer-time weddings, when receptions are typically more casual. All of these can be formal (sit-down), but they are usually served buffet style. Lunch– This is a nice median between a brunch and a dinner. Also, it is typically in the middle for price and formality. If you are having an afternoon wedding and wanted it to be a little more formal than a brunch, you’d be better off with a lunch meal. This meal is great all year round and its middle-of-the-road attributes make it great for any style or budget. Cocktails or Dessert Only– These are typically the simplest meals. Cocktails is mostly just drinks, and desserts only is exactly what it sounds like. These can be less expensive that the other meals, but sometimes the costs of drinks or fancy pastries can really add up. Plus you’ll want to account for everyone wanting to try a little of everything. These options are great for short receptions, or receptions that are late at night (too late for a meal). Dinner– This meal is by far the most popular of all the meals. Unfortunately, it is also the most expensive, especially if you choose a formal sit-down dinner. Generally, if you are having a dinner, it will be for a semi-formal to formal reception. Even though the dinner meal can be served buffet style, dinner has always been considered the most formal meal. If you are having an evening reception that is going to be casual, try something like cocktails or a variation of a lunch meal. When choosing a caterer you’ll want to know what they specialize in, and it would be best if you could find someone that works well with whatever meal you choose. Some caterers will not have a very extensive brunch menu, and if that’s what you want, you should try to find a different caterer that can work with your wants and needs. Once you decide on the type of meal you want, you’ll have to choose the specific foods you’d like. It is usually best to choose foods that you love, but you should also consider your guests (ex: vegetarians, other ethnicities, etc.). If you find a good caterer, they will actually let you sample their food, which may help you decide on what you want served. After you’ve made all your decisions, make sure you book the caterer for your reception and sign a contract with them. Remember to read all the fine print to weed out any excessive costs they might try to push on you. A couple weeks before the wedding you should call them to confirm the reception date, time, and location, as well as the menu you chose. Then call them again a couple days before the wedding for a last minute confirmation.